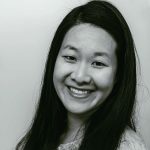 Published Nov 19, 2017 By Julia 7 CommentsThis post may contain affiliate links. 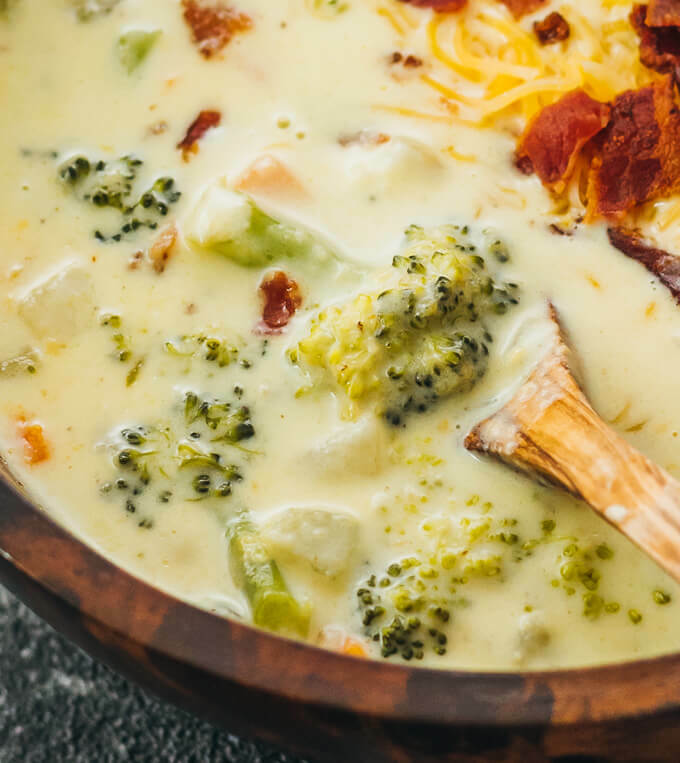 It’s easy to make this one-pot broccoli cheddar cheese soup from scratch. Healthy and low carb. Mr. Savory Tooth and I love the broccoli cheddar soup from Panera Bread, especially as a comforting dinner on cold rainy evenings. I don’t usually crave soups in general, but I make an exception for thick and creamy soups like clam chowder and this broccoli cheddar soup. My version of this classic soup is low carb and healthy, and I avoid using flour as a thickener so it’s gluten free as well. The soup’s texture is smooth and creamy, and it’s on the heartier side with a high ratio of ingredients to liquid. The broccoli florets are very tender, and mixed with diced onions, carrots, and celery. The soup is loaded with toppings including shredded cheddar cheese and crispy crumbled bacon. 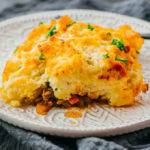 As a one pot meal, it’s a very easy fall or winter recipe. As a low carb eater, I don’t use wheat flour or any kind of flour substitute to thicken this soup. 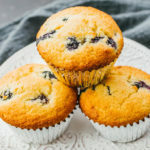 Almond flour doesn’t work as a thickener because it doesn’t release any starches. From my experience, the easiest way to make a thick sauce or soup using zero carb ingredients is to adopt a mixture of heavy cream, melted cheese, and butter. This combination always works well and allows me to avoid using flour. I use this trio often, recently in my loaded mashed cauliflower recipe. I suggest buying mirepoix (pronounced MEER-pwah) to make this soup. Mirepoix is a ready-to-use package of pre-diced and proportioned amounts of onions, celery, and carrots. These ingredients are great for stews and soups like chicken noodle soup. Mirepoix is available at most supermarkets, and I get mine at Trader Joe’s in a 15 ounce tub that amounts to half an onion, 3 carrots, and 3 celery stalks. 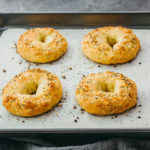 This is a great time saver, allowing you to significantly reduce your prep work for this recipe. I have been moving away from using stock or broth in my recipes. I find that store-bought stocks and broths lack both nutrients and flavor, and provide no value to my dishes. 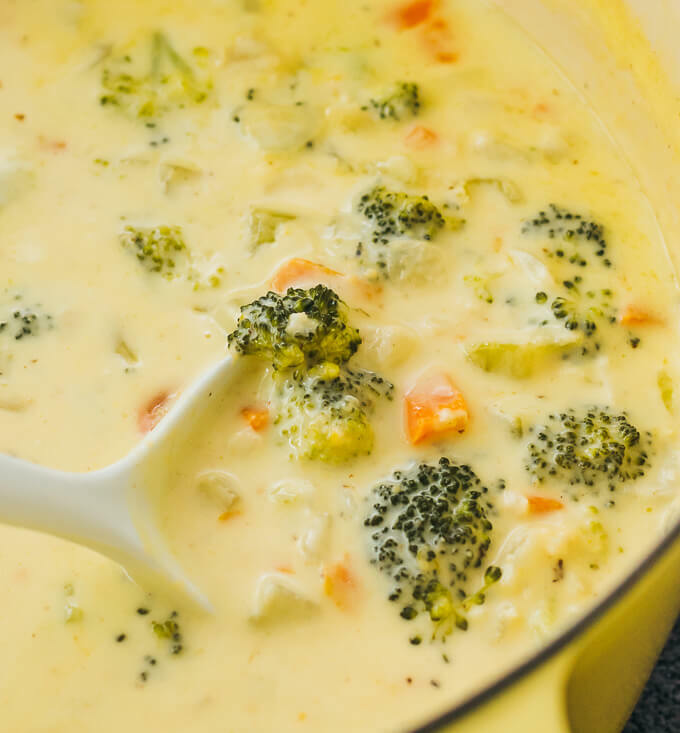 For this broccoli cheddar soup, I used water and heavy cream to build my soup base. I couldn’t tell any difference between my version and those with stock or broth. 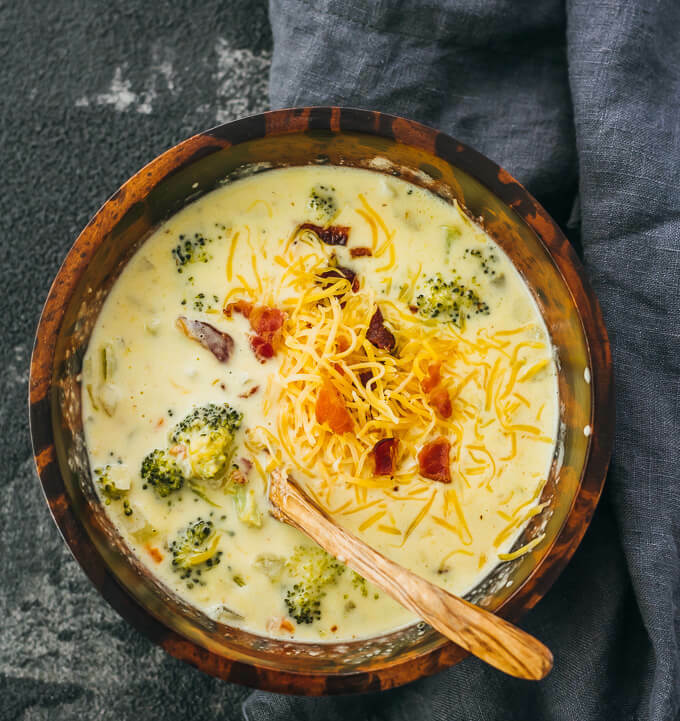 This broccoli cheddar soup is one of those dishes that you can really make your own. You can add extra vegetables, different soft cheeses, garlic, scallions, or sour cream. Leftovers store and reheat well — cover and refrigerate to store, and place in a microwave-safe bowl to reheat. I recommend eating leftovers within a few days. 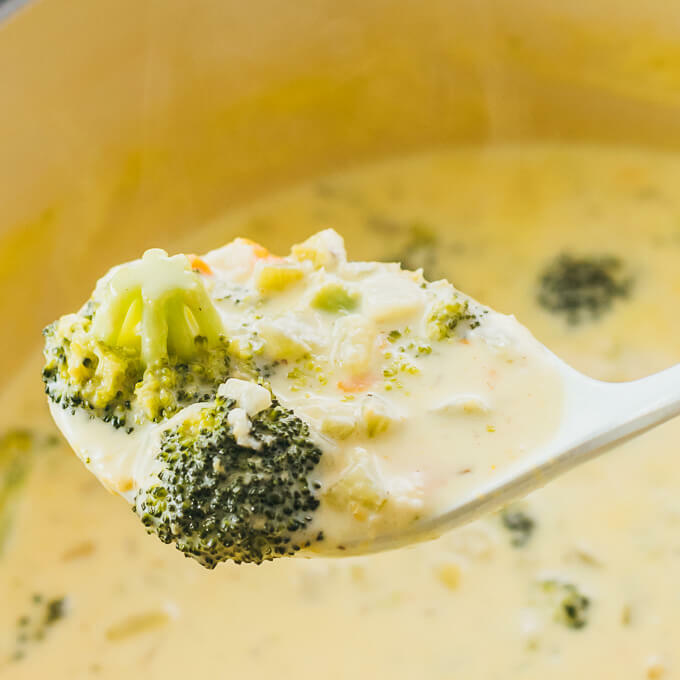 An easy broccoli cheddar soup recipe, made from scratch. Healthy and low carb. Place bacon strips in a single layer in a dutch oven or large pot over medium heat. Cook until crispy, 5 to 10 minutes, flipping occasionally. Transfer to a paper towel to drain. Add diced onions, carrots, and celery to the pot with the bacon drippings. Cook over medium heat until softened, about 10 minutes, stirring frequently. Add chopped broccoli, heavy cream, and 2 cups of water. Bring to a simmer over medium-high heat and reduce to maintain a simmer. Simmer until the broccoli is tender, 5 to 10 minutes, stirring occasionally. Slowly add shredded cheddar cheese, stirring in until melted and incorporated into the soup. Add butter and minced garlic, stirring until the butter is melted. Simmer for about 10 minutes to thicken the soup to your desired consistency. Taste the soup, and add salt and pepper to taste. Serve hot in bowls. Sprinkle additional cheddar cheese and crumble bacon on top. Love this soup! Used Kerry Gold cheddar cheese. Only change was I added the bacon to soup during last simmer instead of as a garnish. This is a keeper! Thanks Dan, hope you enjoy it! I decided not to use bacon and opted in using about 4 tablespoon of olive oil. I was concerned it wouldn’t be as flavorful, but to my surprise it came it really good. Btw can I freeze this soup? Glad it came out well! I haven’t tried to freeze this so I can’t say for sure. My guess is no because of the cream. Loved this, thanks for sharing! Can’t wait to make again.